Users have expressed demand to connect to databases, and Wealth-Lab listened: this provider helps connect to any ADO.NET compatible datasource. Out of the box, a typical PC with .NET framework supports Oracle, OleDb, ODBC, SQL Server and SQL Compact. If other database installs its .NET driver in the system, the provider can autodetect and support it - for example: SQLite, Firebird, MySQL etc. To work with a database containing some data, you need to create a new static DataSet first. Pick the appropriate Provider from the list of available ones (e.g. 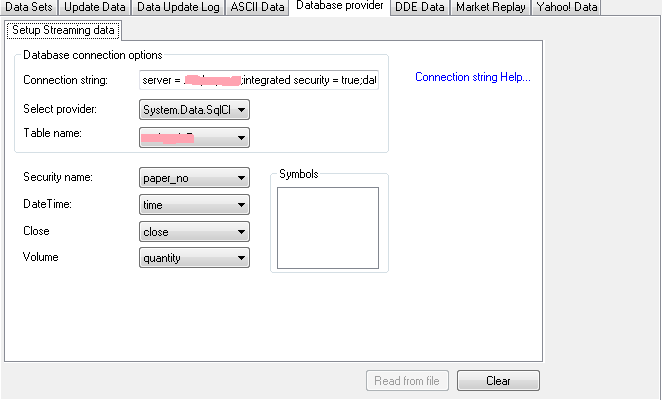 System.Data.OleDb/ODBC for Excel, Access, text files and lots more, System.Data.SqlClient for SQL Server etc. ), compose a connection string, and you're ready for the next step. Usually, this is a no-brainer for the database guys, but should you feel lost in connection strings, clicking the bluish Connection string Help label will try to guess what kind of database you're trying to connect to, using the bits and pieces of your connection string and/or selected provider, and take you to the relevant page of the connectionstrings.com site. Your connection string should include a database name. A rule of thumb is to first type in a connection string and only then proceed with selecting a provider. When you're finished with this step, the provider will populate the Table name dropdown box with the list of tables found. Select the one you need to make the provider fill the other boxes with available fields. Upon defining a field to serve as Security Name, the "Symbols" area is populated with found tickers. Note: when database contains thousands of symbols, this step may take a while (several minutes). Please be patient. Match available fields to DateTime, Open, High, Low and Close. Volume and Named Series are optional. Note: for symbol names, you should use the varchar() type, not text. The provider won't let you confuse a DateTime field for prices and vice versa. To finish creation of your DataSet, select a bar scale and interval. At any time, only one data source for streaming quotes can be defined. It's a global setting. To specify a database to use for real-time quotes, open the Data Manager tool, switch to the Database provider's tab, and repeat there all steps taken when completing the "New DataSet Wizard". For streaming quotes, only the Close price is required, Volume is optional. Finally, set "Database provider" as your current streaming provider in the Wealth-Lab's Preferences dialog, Streaming. Push "Clear" button before first-time configuration or when changing settings. You must restart WL6 after changing Streaming settings. Note to MySQL users. Do not install Connector/Net (MySql.Net) version 6.7.4 as it will not work due to a bug. Instead, install latest version (6.9.3 at the time of this update). Note: when using MS Access tables for streaming quotes, it's highly recommended to work via OLE DB and not ODBC. Note: Oracle Database Express 11g is a 32-bit application that is not compatible with 64-bit Wealth-Lab, so you must use 32-bit version. Note: on 64-bit operating systems, make sure you have installed ODBC and OLEDB drivers of appropriate "bitness". 64-bit Wealth-Lab can't use 32-bit ODBC drivers, and vice versa. For 64-bit drivers, visit this link: Microsoft Access Database Engine 2010 Redistributable. More info: Jet for Access, Excel and Txt on 64 bit systems. This companion article illustrates how to use a Wealth-Lab Strategy to import the data from a large group of ASCII files into an SQL Server database. You have a big bunch of ASCII CSV files from your data vendor containing DTOHLCV series for a large group of stocks. You would like to import all the files into an SQL Server database to run Strategies using the Database provider. As we can see, the symbol is missing - it's a part of the file name e.g. TEST.CSV. Obviously, neither it makes sense to import the data for a group of symbols into a single table (the provider won't be able to tell one symbol from another), nor can we put each instrument in an individual table (too time consuming and inconvenient). Note that symbol names have to be of type varchar. Now, it's time to index the table. Obviously, the Symbol field has to be indexed in any case or querying the database would be too slow. If you don't plan updating the table too often, use more indexes - otherwise, don't over-index your table. Although a command line utility could be created, why bother with a C# IDE or .NET SDK when we have the Wealth-Lab's built-in Strategy Editor? One obvious problem is that the data files are missing the Symbol column that is the index of the table. We're going to get the current symbol from the file name (i.e. Ticker.CSV) and insert the missing piece on-the-fly. Below you'll find the complete code of a WealthScript program that imports all .CSV files from a directory into a single table. 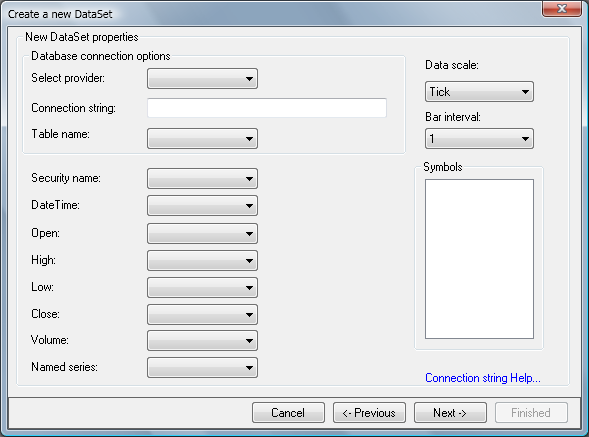 Key parameters such as the connection string, table name and source folder are configurable. Follow the comments to understand the logic. Note: before using this code, in the Wealth-Lab's Editor, open the "References..." dialog and tick two checkboxes - next to System.Data and System.Xml.